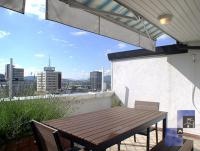 Apartment ANA with a beautiful terrace is located on top of the building on Pražakova street, in vicinity of the main bus and railway station and only 500 metres from the Triple bridge. 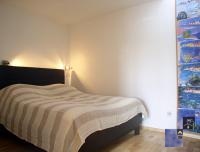 This modern apartment has two bedrooms, one with a queen size bed (160 x 200 cm) and the second with two single beds. Bathroom has a bath tub with shower, bidet, toilet and a washing machine. In the main room there is a living corner with LCD TV and sofa, which falls down to a bed (120 x 200 cm), a dining corner and fully equipped kitchen with stove, bar stools, refrigerator, washing machine, oven, small kitchen appliances, dishes and cutlery. From the main room there is an access to the terrace where you can enjoy in a wonderful view over the city. On the terrace there is a large table with chairs, place for sun bathing and a shower. During hot days the terrace can also be covered with retractable overhang. The apartment is fully equipped with towels, linen, iron, ironing board, hair dryer, LCD TV, CATV, free broadband wired and wireless (Wi-Fi) internet access, air conditioning. Apartment is on the 11th floor. There is an elevator to the 10th floor, but then there are stairs to another floor. It is possible to park a car on private parking in front of the building, if there is available space. Self service buffet breakfast against additional payment 11 € at City hotel, Dalmatinova ulica 15 (350 m).